Last month, Starz gave us a look at their upcoming new series Black Sails with the pirate drama's first trailer, and today, not only do we get an excellent new poster, but also a premiere date. Well, a premiere month, anyway. It looks like Michael Bay's Black Sails will fill Spartacus' shoes (or sandals, technically) in debuting in January, which was typically when the gladiator series premiered. 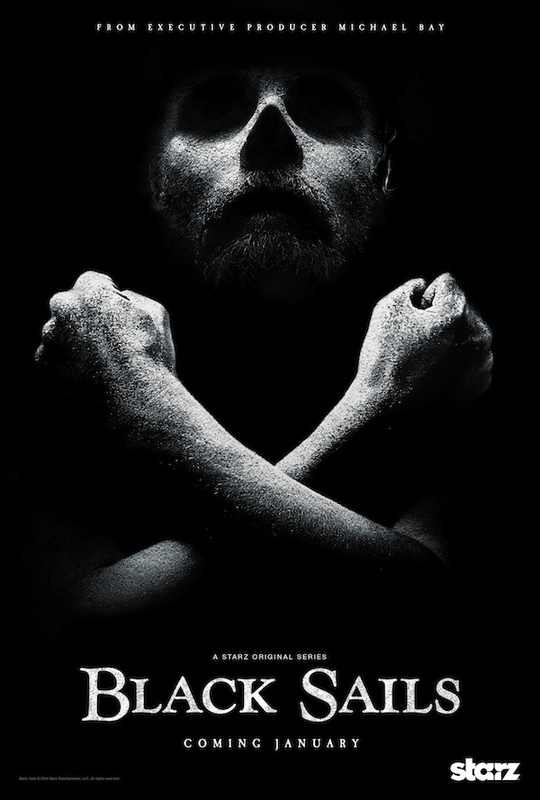 The final key art for the series shows us the shadowed face of a pirate - presumably Toby Stephens' Captain Flint - without eyes or a nose, giving him a decidedly skeletal look, which - added to the way he's got his arms crossed in front of him - depicts the familiar sight of a skull and crossbones. That's just classic pirate stuff right there. Black Sails centers on Flint and his men in the period about two decades before the character appears in Robert Louis Stevenson's Treasure Island. The story follows Flint, who's known to be the most brilliant and feared pirate captain of his day, as he takes in young John Silver (Luke Arnold), who may sound more familiar by name with the eventual title of "Long" before it. Threatened with extinction on all sides, they fight for the survival of New Providence Island, the most notorious criminal haven of its day – a debauched paradise teeming with pirates, prostitutes, thieves and fortune seekers, a place defined by both its enlightened ideals and its stunning brutality. It's a great poster, not only because it gives off that great pirate vibe, but also because it hints at danger, which is traditionally what a skull and crossbones warns of. And danger usually translates to excitement for a drama series. Black Sails is executive produced by Michael Bay, better known for his explosion-filled films like Transformers and Armageddon. Jericho's Jon Steinberg, however, is credited as the series' creator and showrunner. The series is currently filming in South Africa, and it looks like we'll find it airing on Starz come January.